Re: How old is everyone? We could make a "chi-chat corner" for those near 60 (I've already counted 6). But remember: The time to begin most things is ten years ago. Johnniespeed wrote: 59 now, but it seems like I was 25 just a little while ago. 28! Got my first scooter ever about a month ago. A 1985 Honda spree. I've always heard the old saying "Sleeping with a fat girl is like riding a moped, it's all fun until your friends see ya." Nah they are fun all the time! 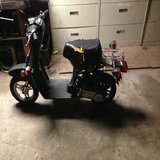 I've owned several quads, dirtbikes, and go carts but this old 85 scooter brings me more joy than all those ever could. Who would have known that? Just about everyone here knew that! What he said... I say the same thing to most of my friends, they all think i am nuts. Especially when I inform them that my scooter is not even good on fuel efficiency. Yeah I definitely am happy to have found scooters. My dad had a couple scooters that I used to ride. They were old Cushman Eagle scooters. That's the first scooter I ever rode. But I look at those as something I wouldn't want to ride on a daily basis because they are so old and mint. My spree that I have puts a smile ear to ear and it is the ugliest thing ever hahahaha. Cant wait until winter so I can put some good work into my spree so it looks a lot better. First post. I'm 45 bought a brand new Aero 50 in 1985 or so it was a god send after all the Italian- French mopeds I was screwing with that couldn't make it anywhere without breaking down. It wasn't. My father let my cousins in Ohio "borrow" it and I didn't know until I went there for a funeral and saw it covered in house paint in my aunts garage. I was F-n * so made them send it back to me. I tried to wetsand all the paint, repair broken fairings. gas tank was screwed I ended up getting rid of it.. So I've been collecting things.. An Opel GT, Honda reflex trials bike and the other day I walked into the alternator rebuilder and there it was an 87 Aero 50. He said it wasn't charging and maybe wanted to sell it so.. How much? 600 with 3k mi. I said 500 and he dropped it off. 1985 NQ50 Spree Stock Red- Non-running. My bike is 1.58 times as old as I and my mother is 7 years older than the bike. I am half as old as my mother but older in 2 days. I believe I may have made a boo boo im 18 but 19 on the 10th, my bike is 30 and my mother, may we not say the madems name but rather hint at it. I at least attempted to spice things up a bit, but may have made myself look incompetent. I bet you guys cant guess who isnt passing math. Wait im confused 30 / 1.58 = 18.9 but mother is 37 and the bike is 7 years older. Therefore I may be just missing something or did not include enough information. Idk please excuse this whole post I have no clue what is going on, as I have much to learn and as you can s3e we dun not learn write now.